At times of crisis presidents often try to restore the people’s confidence and rally them behind a new vision of the future. During this time of uncertainty, President Johnson masterfully spoke in a calm and reassuring fashion. In the speech, he both eulogized Kennedy and established his own legitimacy as president. 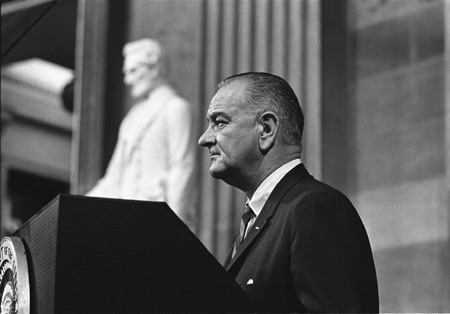 President Johnson vowed to continue Kennedy’s initiatives, voicing his support for President Kennedy’s stance on the Vietnam War, his welfare program, and his goals in regards to civil rights. Supporting elements of Kennedy’s plans and introducing a few of his own, President Johnson both appealed to Kennedy’s supporters and tried to rally the nation behind his own vision of national unity. Almir Hodzic, Undergraduate intern at the Center for Democratic Deliberation, Penn State University.